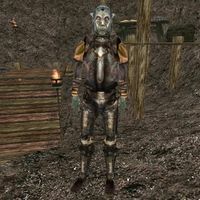 Relam Arinith is a Dunmer smuggler, and a Brute for the Camonna Tong. He can be found in the basement of Fatleg's Drop Off in Hla Oad. Relam is in possession of a Khajiit slave, Rabinna, who he needs delivered to Vorar Helas in Balmora. He wears an iron cuirass with matching greaves and boots along with a common shirt with matching pants. In combat, he relies on an iron shardblade. Aside from his natural resistance to fire and the sanctuary provided by his ancestors, he knows no spells. Greeting: "Greetings, friend. Interested in doing some business?" doing some business: "Tell you what...I've got to deliver this slave to a Vorar Helas in Balmora as part of a payment. It shouldn't be a tough job for you." "Yeah, just a little unfinished business between Vorar Helas and me. I owe him big for a deal we made a while ago. Rabinna here ought to pay for my side of the bargain, and more. There's a lot of money in some of these slaves. You interested in the work?" I'll deliver the slave to him for you. : "Excellent. You'll find Helas in Balmora, in the east side of town. Just tell him Relam Arinith sent you. Take care with this slave, friend. She's worth more than you can imagine. Rabinna here might not look like much, but it's what's on the inside that counts. Know what I mean?" Sorry, not interested. : "No? Too bad. Just means I'll have to get her there myself. Your loss, friend." "Yeah, got to get that Khajiit to Balmora, one way or another." "Heard you took care of that for me. Thanks." "I heard you brought that slave to some abolitionists. That cost me a lot of money, fool. I can't let that go too easily." "I heard that the old kitten was dead. I sure hope you took care of things with Vorar Helas. He knows you're responsible." "You killed my slave! I needed her for business!" "Vorar is dead, huh? Well, not my problem, really. Just means my debt is forgiven." If the aforementioned quest is completed in Rabinna's favor rather than his, he will attack you on sight. This page was last modified on 25 August 2016, at 19:40.